For those who are fortunate, a family in chaos still functions as a family. And all of the turmoil that travails them (whether comedic or caustic, merely fantasized or fully realized) is balanced against a certainty of love. 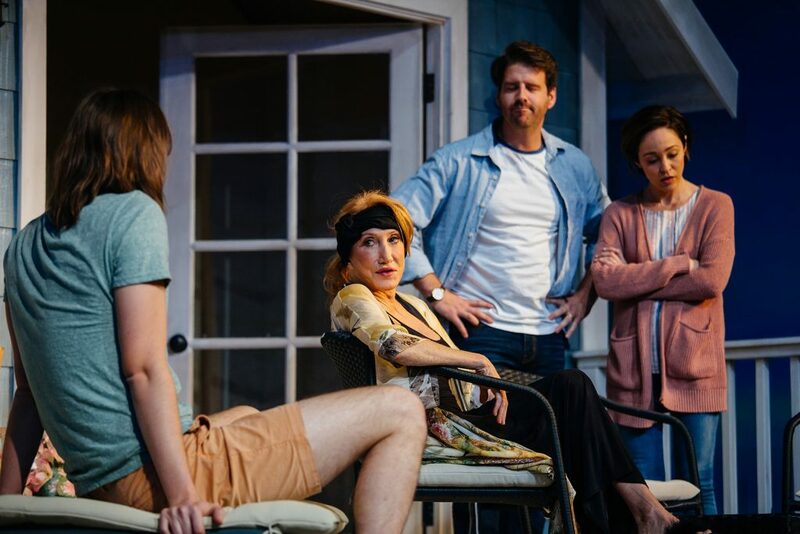 One of the gifts to the family looked in on in Nicky Silver’s off-Broadway play Too Much Sun, (directed by Bart DeLorenzo and running through April 21 at the Odyssey Theater) and to those of us doing the looking, is a glimpse of what real love feels and sounds like. Even if we never quite understand exactly where it comes from, or how it’s able to hold its own against fear and jealousy, loss and disappointment, we are still able to see it do just that. In Too Much Sun family functions not only as a collar and a chain holding its prisoners in place, it is also a pathway to freedom. Eventually each character comes to the edge of a personal precipice. Audrey Langham (Diane Cary – creating the perfect matriarchal totem around which a family can fall apart and reassemble in moments of tragedy and comedy) steps right into her precipice in the opening moments of a wonderfully staged and acted prelude. She realizes during dress rehearsal as the lead in Medea (don’t ask, just trust me the comedy starts there) that she doesn’t like her costume, doesn’t want to be there and really, really, really needs a cigarette. In a few short lines she reveals the discomfort, the loneliness and dark humor of a slipping soul, alone on her marks – both in her role and in her life. In that moment she makes a stunning decision that proves fateful for her family to whom she flees for refuge. This is a wonderfully staged play. It works in any number of ways, but part of its transcendence derives from the scenic design of Alex M. Calle, which expresses the close quarters of the characters confinement (which communicate the familial tensions just fine, thank you) while simultaneously giving the feel of a metaphorical island, isolated, floating not in the ocean, but loose – adrift in the cosmos. Not only do the characters feel separated from life’s humdrum existence and left to face (or, better said, to find) their truths – so are we drawn in, to join them, to leave the outer shells of our own lives behind as well. This is no small accomplishment. It was the core conceit of Rod Serling’s early 1960’s series The Twilight Zone. Every story was set in a distinctive feeling place that was no place. Yet each story somehow recalled a place each of us knew somewhere inside ourselves – in our own, personal geography of dreams traveling towards fleeting thoughts, recalling a memory made of a mirage. None of us had ever really been to the cornfield where Billy Mummy sent the ‘bad, bad people’. We had never flown across that part of the sky where William Shatner watched a gremlin dance on a doomed wing or visited the monastery where the devil had been captured and held prisoner. But we all knew where those places were – just out of reach of our redeemable recollections. Calle summons the same kind of subconscious connections to places we have never been – but somehow know must exist. He is working that level of magic. Which is made all the more fascinating because the play is set outdoors, in the sunshine. No noir-ish shadows to build the feeling of fate hovering here. In keeping with the distinctive achievement of place and feel of this production the cast accomplishes the great feat of never pulling you out of the setting that has seduced you. They are all people we know, or have known or have sensed we may meet – one day. Diane Cary’s Audrey has the perfect blend of love (for tobacco and for family) and saucy selfishness to provide the lightning rod centered in the carousel around which the story revolves. And if it just works out that what is best for everyone else (whether they know it or not) is also what is best for her – well, she was about to star in Medea! Autumn Reese as Audrey’s daughter Kitty is masterful as the character around and upon whom most everything happens. She appears with such realness you find yourself wanting to turn your head away for fear of intruding on someone’s personal moments. This in turn makes her the perfect representation for what for me was the heart of play – the difficulty that accompanies building friendships, relationships, even lives with people who don’t know that they don’t know themselves. As the story unfolds we are faced with the realization that (most?) people require the safety of relationship to begin to face and process, and then perhaps to question, the impacts of things that have happened to them. They find glimpses of themselves through their relationships with us. And as Kitty’s husband Dennis (Bryan Langlitz), neighbor Lucas (Bailey Edwards), Lucas’ father Winston (Clint Jordan) and Gil (Joe Gillette) Audrey’s agent’s fixer who wishes he had become a rabbi discover – by that time it can be pretty late. But still pretty funny. So I think what Nicky Silver is saying, through Bart DeLorenzo’s direction, is that we we should make the effort to know these people who surround us, whom we love, and also to know what has been done to them. What about their lives they are trying to protect us from. And what about our own lives won’t we know without them? It is the revelations and the ensembles flawless portrayal of the impact of what was hidden or unacknowledged on the lives of their friends and family that makes Too Much Sun so compelling. Silver’s characters are comfortable asking the obvious questions. But what he is showing us is that the obvious questions (the questions that consume or subsume us, that have driven Audrey and Kitty and their satellites to this moment, the questions that we allow to grieve or to vex us the very most, that ignite our jealousy or rage) just don’t matter. Which isn’t to say nothing matters. Kitty’s trust and innocence confronted with the truth of her own life, and of Dennis’, leaves us asking what haven’t we known about people who have been in our lives – who are in our lives, right now. This is an important play. Not only in its examination of secrets but also in serving as a guide about how to continue living and loving as life reveals them to us. No matter whom you come the Odyssey Theater with, I’ll bet you leave with questions. This entry was posted in Miscellanious, Theater and tagged Alex M. Calle, Autumn Reeser, Bailey Edwards, Bart DeLorenzo, Bryan Langlitz, Clint Jordan, Diane Cary, Greg Nussen, Joe Gillette, Nicky Silver, Odyssey Theater, Tatum Langton, Too Much Sun. Bookmark the permalink.